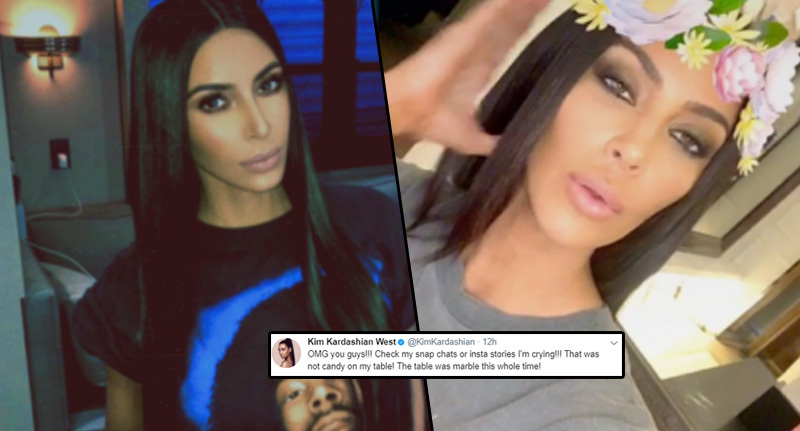 Two white lines in the background of Kim Kardashian’s Snapchat story grabbed the attention of the world yesterday. Yes, that sentence has made me heavily question the world we live in. There were accusations from all angles that the mega celebrity and mum-of-two had lined up a couple of slugs of class A drugs in the same room as her kids, and then posted it to her millions of followers. Kim Kardashian was quick to expel rumours though, with what sounded like the worst lie in the whole world. Kim: ‘No, it’s just sugar’. Yep, the professional selfie taker shut the rumours down by claiming the substance which looks to be perfectly lined up was sugar. Most sane people assumed it was just part of the marble pattern in the table, but she insisted it was in fact a white powdery substance that is most at home in a brew rather than up your nose. It is a bit odd that after seeing the accusations from the thousands of people on Twitter, she didn’t check the table, but assumed it was sugar. We did go to Dylan’s candy shop, I did think it was our pixie sticks, but after all this table in the background is a marble table you guys. Come on, I don’t play like that. I have kids, it’s just not my lifestyle. Then of course the world returned to normality and Kim Kardashian took a selfie video with the marble.